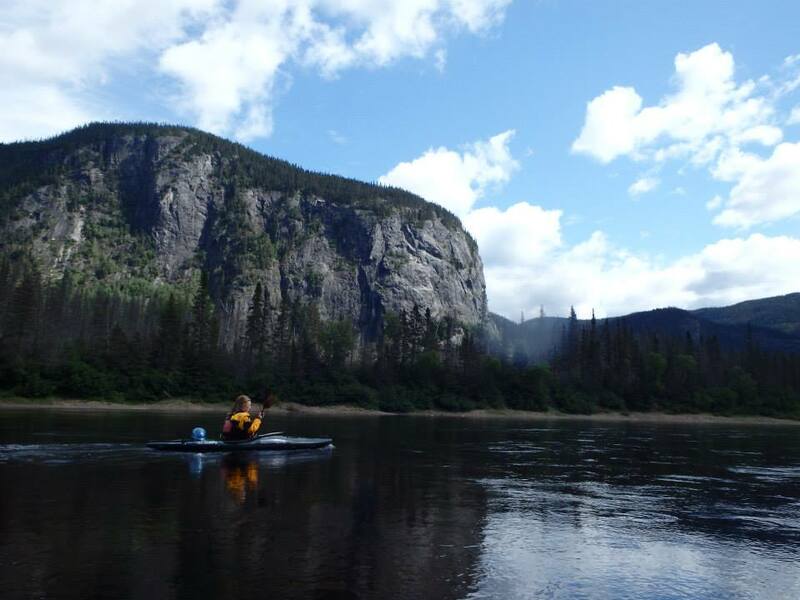 The Moisie River flowing south from Labrador City to the Saint Lawrence Seaway in the Cote-Nord region of Quebec — well-known to canoe trippers — is a phenomenal wilderness kayak camping trip. Its reputation in the Canoe Tripping world is a Class III Route with 21 portages. For the whitewater kayaker with an expedition crossover boat and Class IV and V skill, all but a handful of these portages can be run, offering a classic Quebec lake-drop style multi-day experience. Jake ponders another big one on the Moisie River, Quebec. The Pekans-Moisie Route flows through northern Quebec wilderness for 373km (232 miles). There are roughly 20 Class IV rapids and 8 Class V rapids. 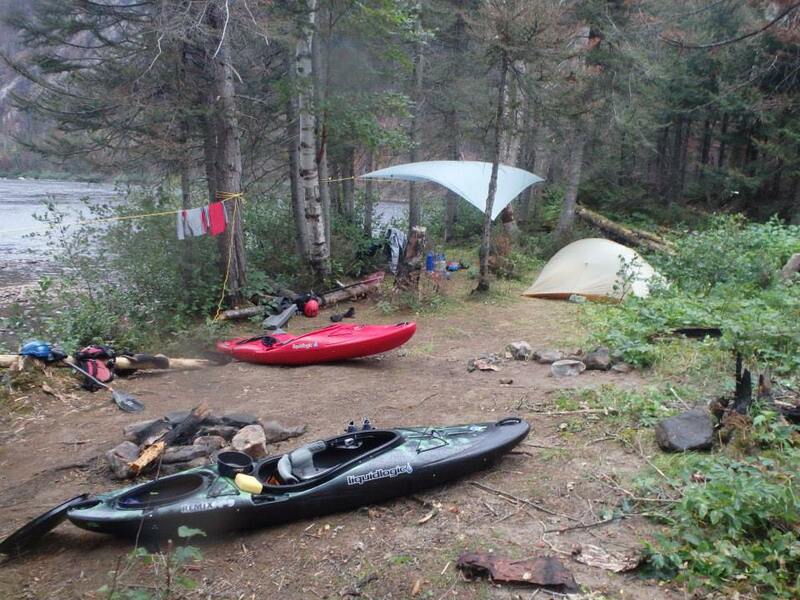 Campsites and portage/scouting trails are well established. From the put-in, the Pekans river meanders through a series of dead water lakes, separated by runnable, fun, ledge drops. The Pekans maintains this character for 70 km. While there are 7 rapids rated IV or V in this stretch you will appreciate having a skeg for the dead water. The action picks up for a 10 km stretch when the Pekans drops into the Moisie river basin. 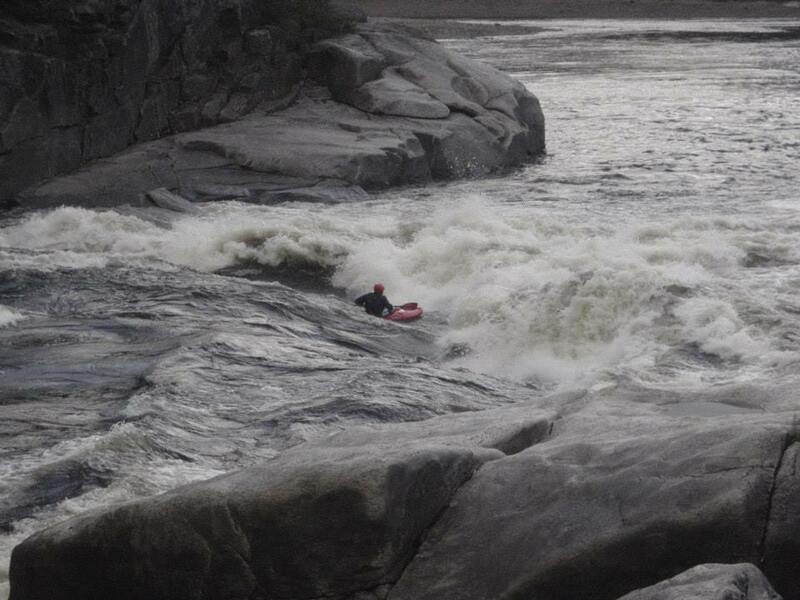 This section starts off with a fun Class IV/V rapid ending with a 15′ plunging whole punch. The river continues to drop over class IV and V ledges leading up to a huge 100′ waterfall. Scout and portage on the right. There are a lot of good lines in this section to pick apart. Proceed with caution and locate your exit point before the big drop at the end. Beautiful and remote camping in the north woods of Quebec. Class II-IV rapids continue after the waterfall down to the Big Portage into the Moisie. Pick off as many of the rapids as you can handle as you approach the 1.3 km portage. 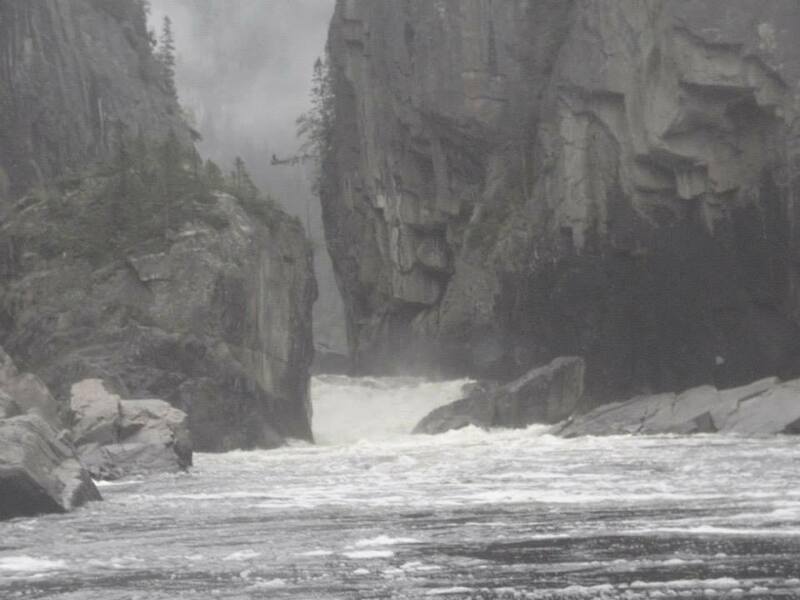 There is good whitewater below the start of the marked canoe portage, but approach with caution. The river quickly moves away from the portage trail as it cascades down into the Moisie proper. The big portage is long, muddy and steep. In 2013, wildfires had obscured the portage trail. There is no good camping at the end of the portage; plan your day so that you have time to get the portage done and get downstream to the next campsite. 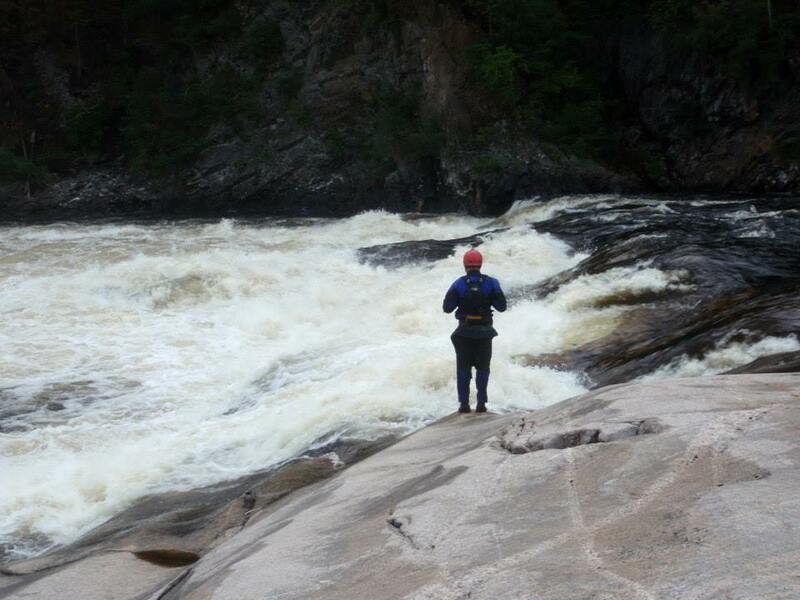 Big rapids and big canyons on the Moisie, Quebec. Once on the Moisie proper, the river picks up the pace and the rapids are more consistent. The Moisie flows through a 3000′ deep granite-walled canyon with stunning waterfalls and cliffs rising up from water level. The whitewater is quality through this section, although there are a few more significant portages. The first signs of civilization are about 240 km into the trip, at the end of the last big portage, where pass a government salmon monitoring camp. After this camp, you will pass a handful of luxury fly-in fishing camps, and the river eases up on the rapids while maintaining stunning scenery and a consistent flow, allowing for high-mileage days. Jake exits an imposing granite canyon on the Moisie. The last 10km hold a couple of good Class IV/V rapids and one longer rapid under the railroad trestle. After the final Class V, the river widens and slows as it approaches the St Lawrence Seaway and take-out. The put-in is on the Trans-Labrador Highway Rt 389, where it crosses the Pekans River 30 minutes outside of Labrador City. The take-out where highway 138 crosses the Moisie 5 km outside of Sept Isles. The QNS&L Rail line (1.709.944.2490) will book vehicles as freight from Labrador City to Sept Isle for around $400. The Clerk at the train station even offered to shuttle me back to the put in. Once you arrive at the take out either hitch-hike or taxi to your vehicle that will be parked at the Sept Isle Train Station. The Pekans into the Moisie is a perfect run for the expedition whitewater class of boats. The whitewater is quality, scenery stunning and campsites are well established. This trip is appropriate for Class III+ through Class V paddlers. The portages and rapids are well marked and trails established so the trip is accessible to a wide range of paddling ability. Class III boaters should plan a couple of extra days to account for additional portaging. Class V chargers will discover quality stout drops and rapids. Liz Wehmeyer enjoying the scenery on the Moisie. This article was contributed to CampingByKayak.com by Jake Risch.